The People. The Schitsu’umsh are an Indigenous people, with a Tribal enrollment of approximately 2,400 members, located on the Coeur d’Alene Reservation of Idaho, of 345,000 acres. The reservation was established in 1889, through an Executive Order Agreement with the federal government. The Coeur d'Alene Tribe continues to define and assert itself as a sovereign nation, providing for the educational, economic, health and social wellbeing for the entire community. 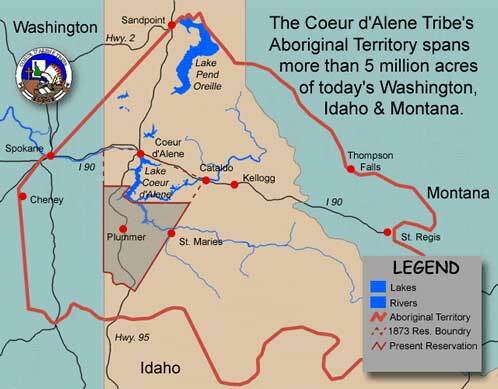 The Coeur d’Alene have cultural and historical extensions onto “ceded lands” off the reservation, of approximately five million aboriginal acres of north-central Idaho and eastern Washington. Before contact with Euro-American influences, circa 1750s, the Schitsu'umsh numbered some 5,000. Their Interior Salish language and culture is shared with their neighbors and close relatives, the Flathead, Kalispel, Pend d'Oreille, and Spokane. The term "Schitsu’umsh"literally means, “the ones that were found here,” in reference to their origin place, Lake Coeur d’Alene. The people are also referred to as the “Coeur d’Alene,” meaning “heart of an awl,” derived from the early French-speaking fur traders who found the Schitsu’umsh shrewd and aggressive traders, with hearts as sharp as an awl. One of these early traders described the Coeur d'Alene as the "greatest traders in the world." As an Indigenous people, the Schitsu'umsh have had a long and intimate relationship with their lake-based, dynamic landscape, "since time immemorial," literally tens of thousands of years. It has been their "Indigenous" relationships that have given pulse to their Schitsu'umsh heart, the miyp untrammeled by external Western influences. In turn, it has been their hnkhwelkhwlnet heart that has allowed the Schitsu'umsh to successfully walk the diverse paths that have crisscrossed their landscape, many a path alien, only recently imposed. The Plant. The nutritious tubers of the sqigwts have been traditionally gathered by the Schitsu’umsh in wetland areas around Lake Coeur d’Alene, supplementing their diet. It was among numerous roots, such as camas and bitterroot, that were dug as part of the seasonal round. In June the delicate white-flowered, large arrow-leafed water potato can be easily seen along the lake's shores. In the fall, any signs of the plant have vanished, only to be discovered six to ten inches down in the shore's mud. Once gathered sqigwts is prepared "like a regular potato," baked or boiled, with its tail left on it, as "the tail holds all the flavor." It is only at the gathering that there is any human interaction with the plant; none at any other time of the year. The root continues to be gathered each October by elders and the youth of the Tribe, in the wetlands associated with Chatcolet and Benewah Lakes (southern parts of Lake Coeur d’Alene), providing cultural identity and educational linkage to their traditional foods and ways of life, and to Lake Coeur d’Alene. 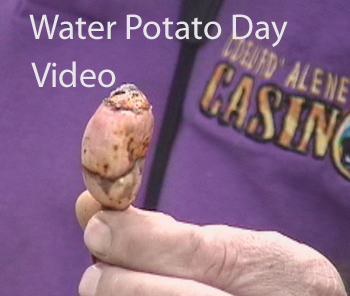 To view a short video on the gathering of sqigwts, involving students from the Coeur d'Alene Tribal School and University of Idaho, go to WATER POTATO DAY VIDEO (recorded and edited by Frey 2001, video upgrade by PK Northcutt 2015, and originally published as part of the Schitsu’umsh: Lifelong Learning Online. 2002). A Question To You? 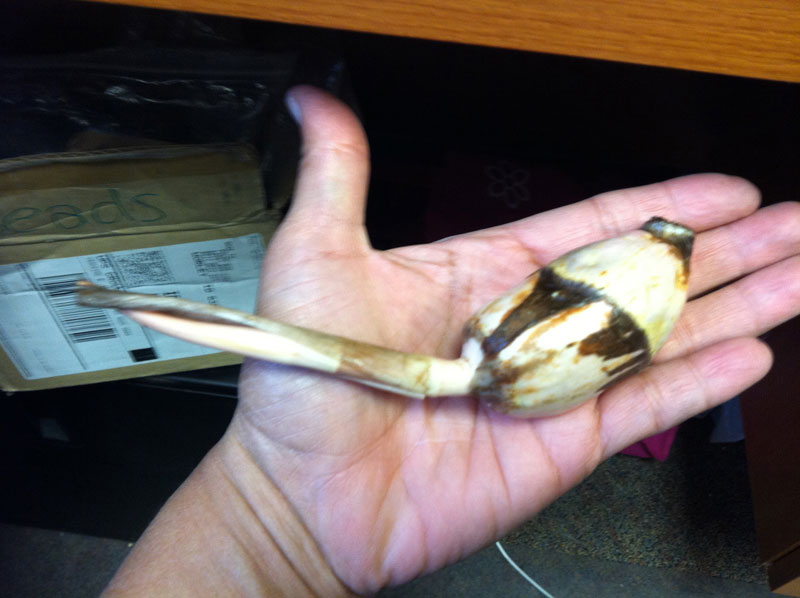 It has been observed by both elders of the tribe and biologists working for the Coeur d'Alene Tribe that the sqigwts plants, when annually engaged in the manner tribal members gather them, will produce larger tubers when compared to the tubers from Sagittaria latifolia not engaged by the Schitsu'umsh. Why is this the case? As you engage the web units and interactive 3-D Landscape of this module, attempt to answer the question, both from a Schitsu'umsh perspective and from a scientific perspective. What additional research or information will you need to help answer this question? What are the implications of the the possible responses to this question as we address climate change? Are there differing ways of knowing and understanding this same phenomena? Place your questions and responses on our Sqigwts Blog, and continue the conversation with others. For information on the biology and ecology of the Sagittaria latifolia, see Lesson Plan: Science. For additional background on the Schitsu’umsh, their history and culture, see the Bibliography that accompanies this module, with reference to such works as Schitsu’umsh and Frey 2001 and 2002.